Throw a Monster Mash Halloween themed party that’s family friendly and perfect for kids. I’m so excited to share today’s post. I love parties. I love Halloween. Put them together and I’m in heaven! 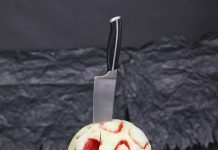 This Halloween party was designed with kids in mind. It’s fun and silly instead of creepy and dark. Welcome to the Monster Mash! There are a lot of fun things going on, so let’s look at each party element one by one. First, could you just die over this big blue fur that I used as a tablecloth? My mom bought it years ago and it is just one of those crazy fun things we’ve loved over the years. 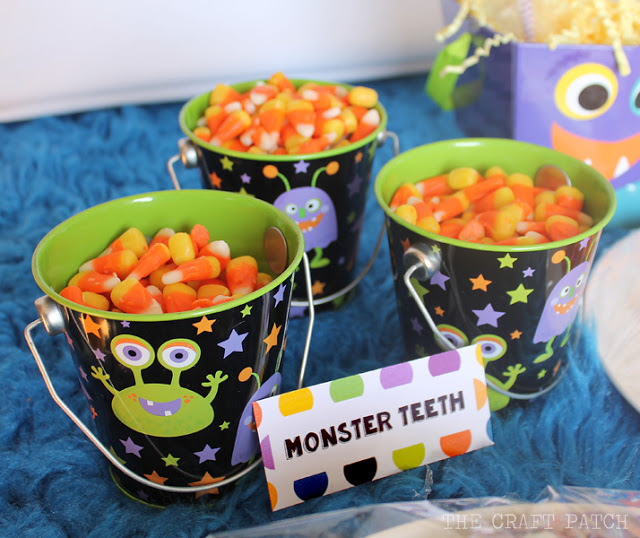 They are really just candy corn, but “monster teeth” sound so much more fun, don’t you think? The buckets are from Target’s Dollar Spot. Love that place. Next are the monster cereal bar pops. 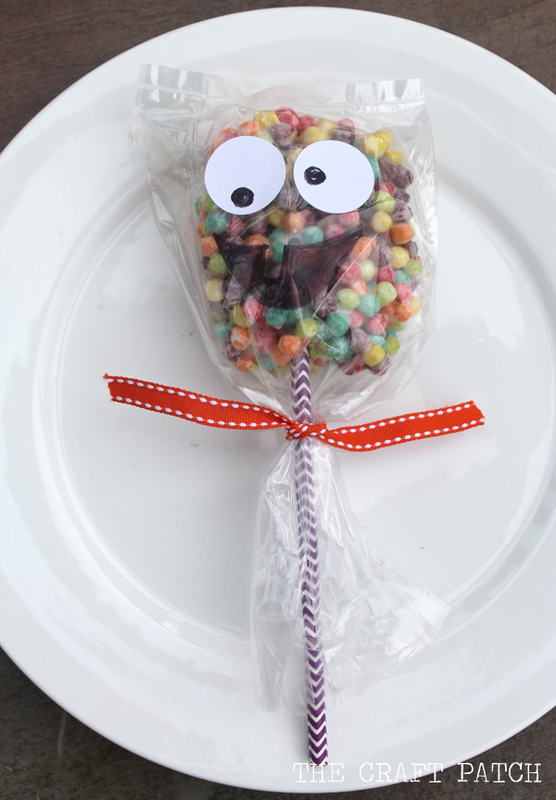 To make them, I followed my normal cereal bar recipe (HERE) but used Mini Trix instead of crisp rice cereal. Did you even know they made Mini Trix? They are so cute and they are delicious in a cereal bar! 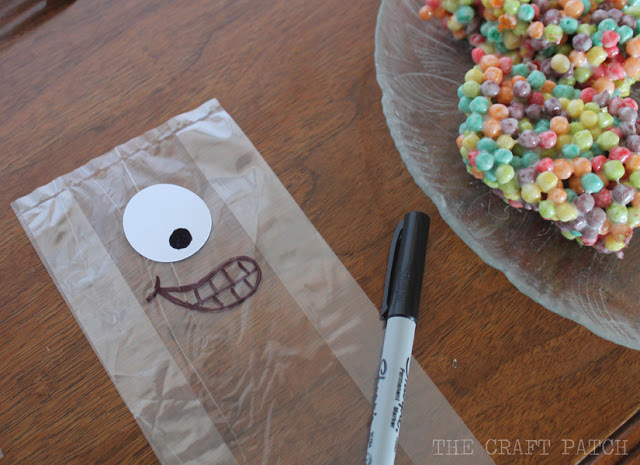 I decorated clear treat bags with white sticker paper eyes and drew mouths with a permanent marker. I cut the Trix bars into rectangles, skewered them with a paper straw (also from Target’s Dollar Spot), placed them in the treat bags and tied them off with a bit of orange ribbon. 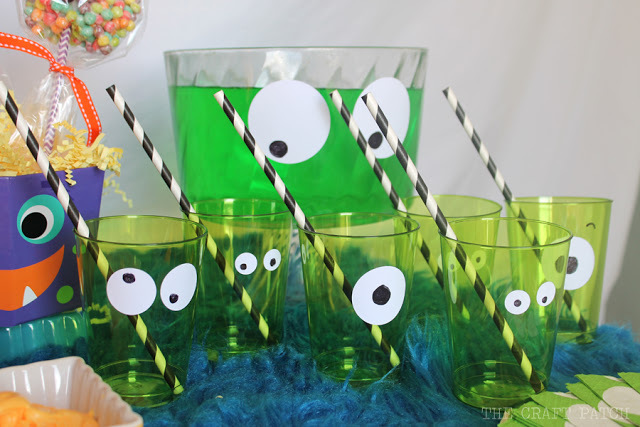 All I did for the drinks was add lemon lime soda to green punch and stick eyes on the punch bowl and cups. Look at this little army of green monsters! 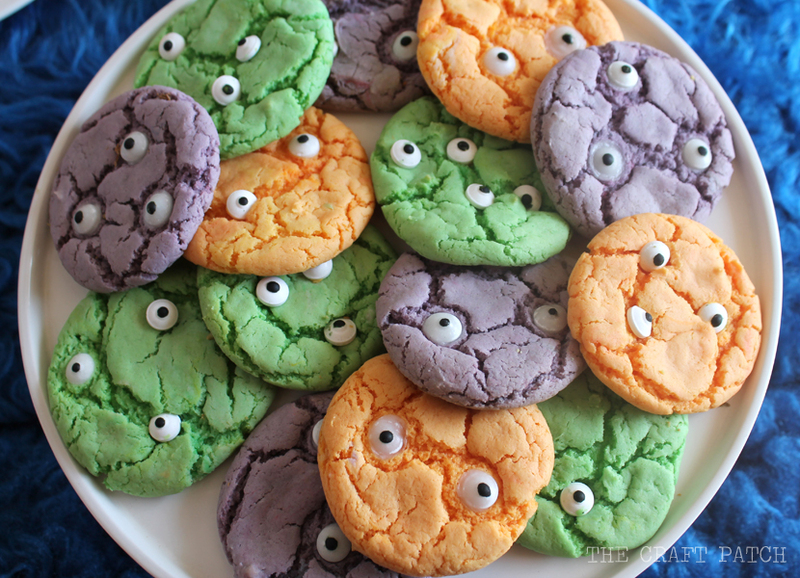 I saw these Eyeball Cookies and had to make some for our Monster Mash. I used my favorite recipe for soft, chewy cookies. 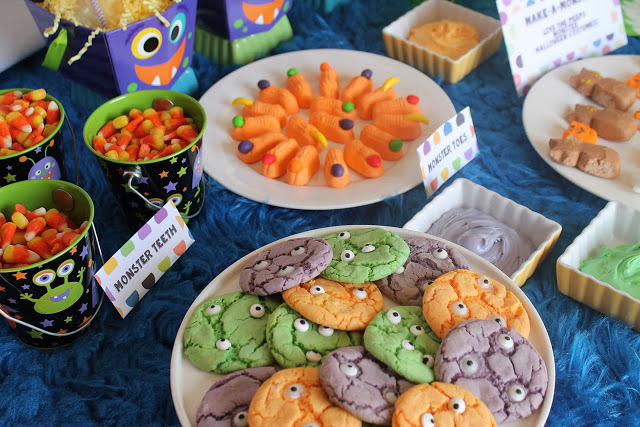 These fun monster cookies are soft, chewy and delicious. 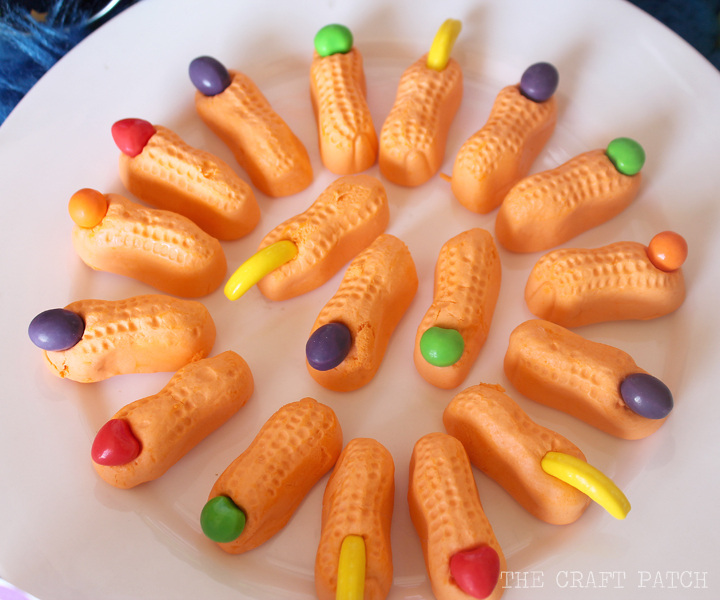 They make a perfect Halloween dessert! 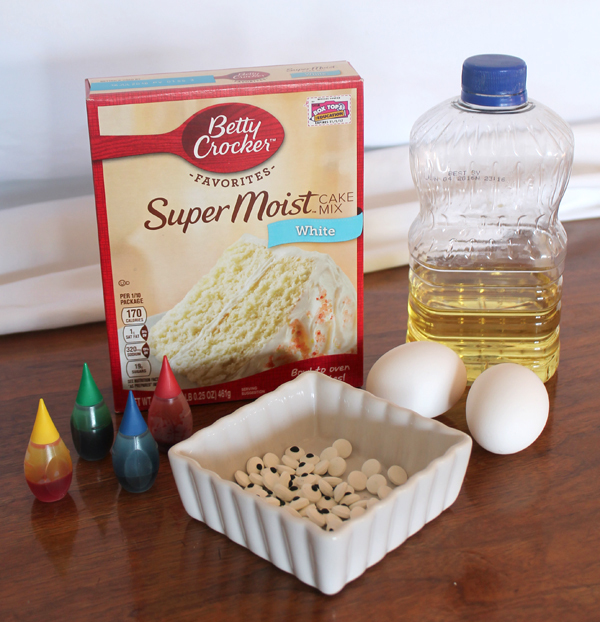 Add cake mix, eggs and oil to a mixing bowl and mix until smooth. Dough will be very thick. Divide into three separate bowls and add food coloring. I made orange, green and purple cookies. Roll into balls and bake at 350 for 8 minutes, or until no longer shiny. Immediately press candy eyes into tops of cookies while the cookies are still hot. 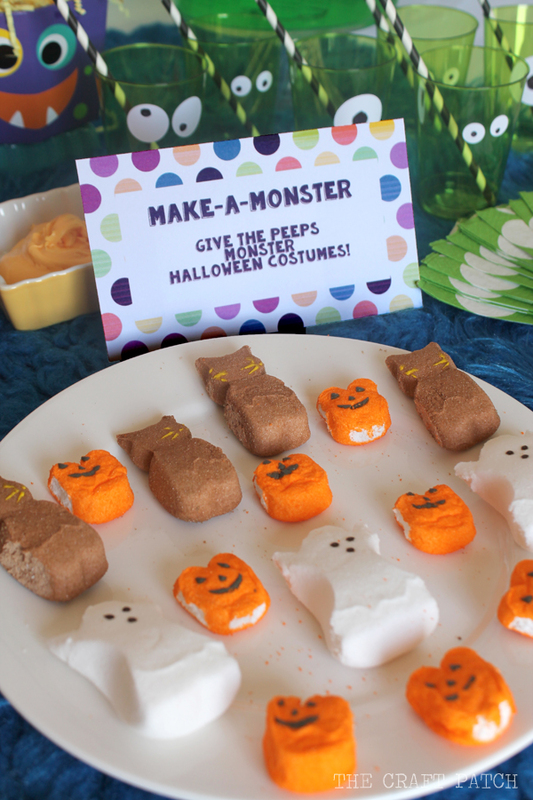 I love treats that double as party crafts, so I decided to have fun with PEEPS. We set up a station for the party guests to make monster costumes for the PEEPS! I bought a special pack of Halloween PEEPS at Target and a can of frosting. They were in the seasonal aisle with all the other baking goodies. I divided the frosting evenly into three separate bowls and dyed it three different colors. Then we went to town transforming our Peeps. 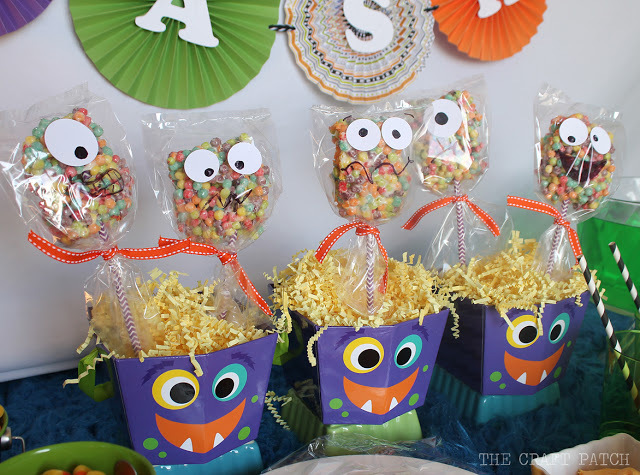 We used some of the leftover Mini Trix and candy eyes too. 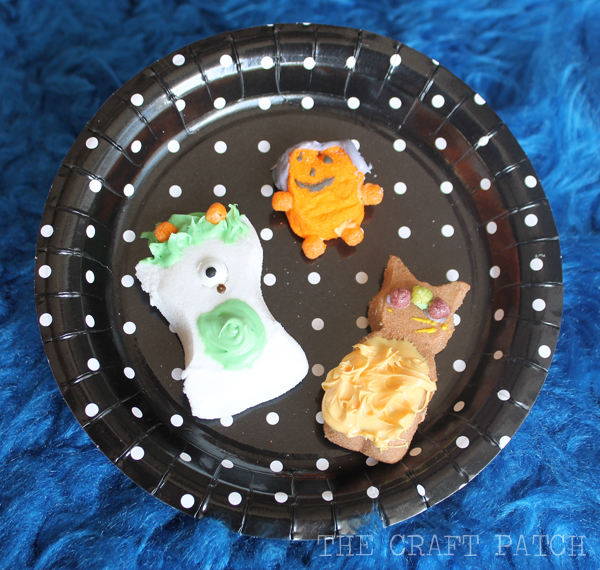 Our little Peep monsters turned out so cute! To save you some time, I am offering the labels for the monster teeth, monster toes and make-a-monster station as free printables. Click HERE to open the document, click on the print icon at the top, print off on cardstock and enjoy! 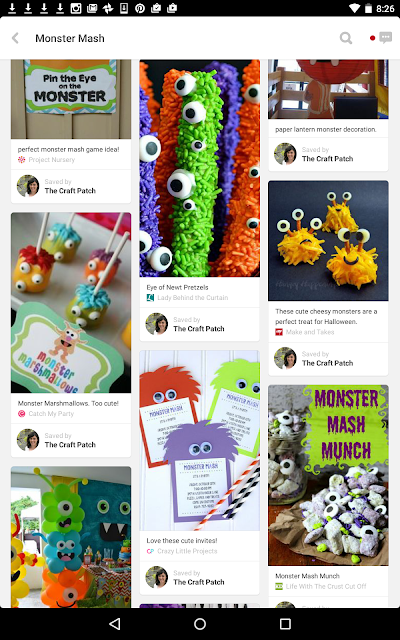 There were so many other great Monster Mash ideas that I dedicated an entire Pinterest Board to them. Check it out HERE. 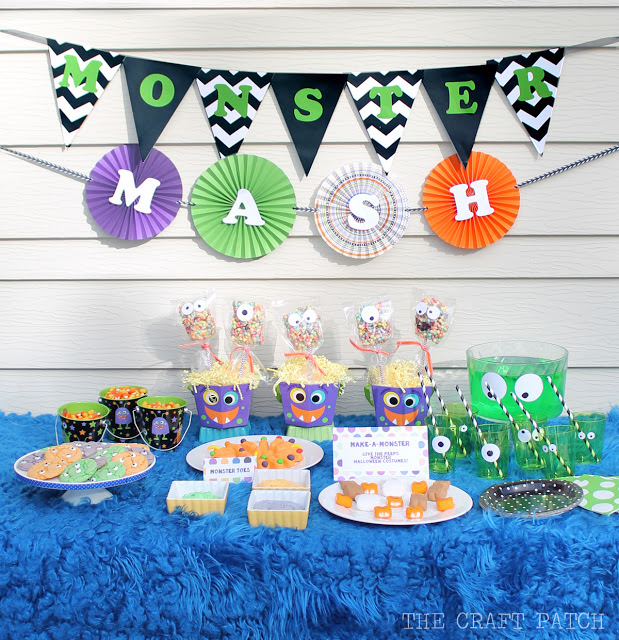 This party was so fun that my seven year old wants a Monster Mash for his next birthday party. I told him that was totally doable. 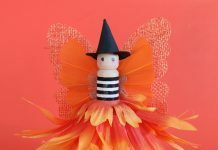 All you’d have to do to make this party work year-round is to add a bit of red and yellow and less black and white and it would be an adorable birthday party!